Laboratorio di Biología Cellulare Respiratoria, Dipartimento Cardiotoracico e Vascolare, University of Pisa, Pisa, Italy. Nitric oxide (NO*) is a gaseous mediator synthesized by Nitric oxide sinthases. NO* is involved in the modulation of inflammation, but its role in airway inflammation remains controversial. We investigated the role of NO* in the synthesis of the chemok Nes Interleukin-8 and Monocyte Chemotactic Protein-1, and of Intercellular Adhesion Molecule-1 by human airway epithelial cells. normal human bronchial epithelial cells and the bronchial epithelial cell line BEAS-2B were used. Neterleukin-8 (IL-8) and Monocyte Chemotactic Protein-1 (MCP-1) secretion and Intercellular Adhesion Molecule-1 (ICAM-1) expression were measured by ELISA. mRNA was assessed by semiquantitative RTI-PCR. Neterleukin-8 secretion was significantly reduced after 24h incubation with the NO* donor, sodium nitroprusside. The effect was dose-dependent. Similar results were obta Ned with S-Nitroso-N-D,L-penicillam Ne and S-Nitroso-L-glutathione. Inhibition of endogenous NO* with the Nitric oxide synthase inhibitor N-Nitro-L-arg N Ne-methyl-esther caused an increase in IL-8 secretion by lypopolisaccharide- and cytok Ne-stimulated BEAS-2B cells. Sodium NItroprusside also caused a reduction in Monocyte Chemotactic Protein-1 secretion by both cell types. 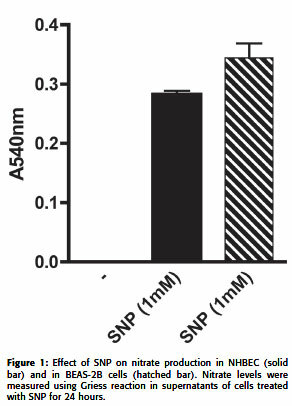 In contrast, Intercellular Adhesion Molecule-1 expression was upregulated by sodium nitroprusside. RTI-PCR results indícate that the modulation of protein levels was paralleled by modification in mRNA levels. NO* has divergent effects on the synthesis of different inflammatory mediators in human bronchial epithelial cells. Nitric Oxide (NO*) is a highly reactive oxygen species identified with the endothelium derived relaxing factor (Moneada et al., 1988). More recently, however,INumerous biological activities besides vascular relaxation have been attributed to NO*. Many of these activities are related to the regulation of the inflammatory process, including modulation of the synthesis of cytok Nes by endothelial cells (De Caterina et al., 1995, Villarete and Remick, 1995,INatarajan et al., 2001) and by monocytes/macrophages (Lander et al., 1993, Ma et al., 2004), down-regulation of Neutrophil aggregation and secretion (May et al., 1991), down-regulation of the release of inflammatory mediators by mast cells (van Overveld et al., 1993), prevention of superoxide production by neutrophils (Clancy et al., 1992). NO* is synthesized from L-arg N Ne through the action of a family of enzymes called NO* synthases (NOS). NOS are expressed by numerous cells, including macrophages, neurons, islets, skeletal muscle cells, and endothelial cells (reviewed in (Murad, 2006)). Once perceived as a passive barrier, in fact the airway epithelium plays a critical role in the maintenance of airway homeostasis. Among other functions, the epithelium Lining the airways contributes to the innate immune system through the synthesis and expression of a variety of molecules, including an array of adhesion molecules and soluble mediators involved in the recruitment and activation of inflammatory leukocytes. Through the action of these mediators, the airway epithelium participates actively in the defense against airborne pathogens, as well as in the orchestration of the inflammatory reactions that characterize several pulmonary diseases (Bals and Hiemstra, 2004). Airway epithelial cells have been demonstrated to express all three isoforms of NOS (Sherman et al., 1999). This, and the observation that fractional exhaled NO* (Feno) varies in pulmonary diseases, including asthma and chronic obstructive pulmonary disease (COPD) (Kharitonov and Barnes, 2006, Abba, 2009), have prompted several studies aimed at investigating the specific role of this molecule in airway inflammation. However, data from animal models have been somewhat contradictory, showing both pro-inflammatory and anti-inflammatory actions (reviewed in (van der Vliet et al, 2000)(Liu et al, 2007)). In an attempt to further clarify some aspeets of NO* involvement in airway inflammation, we investigated in vitro the effect of this molecule on the synthesis of inflammatory mediators by human bronchial epithelial cells. The mouse anti-human-ICAM-1 monoclonal antibody (clone 15.2) was obta Ned from Ancell (BaypoRTI, MN, USA). Formaldehyde, o-phenylendiam Ne (OPD), Bov Ne Serum Albumin (BSA), Trypan blue, N-Nitro-L-arg N Ne-methyl-esther (L-NAME), lypopolysaccharide (E. Coli, serotype 0111:B4, LPS), Griess reagent (modified), N-[2-Hydroxyethyl] piperaz Ne-N'-[2-ethane sulfonic acid] (Hepes), Dulbecco phosphate buffer sal Ne (PBS), Hanks' Balanced Salt Solution (HBSS), In Vitro Toxicology Assay Kit XTT based, Ethidium Bromide, Agarose, REDTaq genomic DNA Polymerase SuperPak and DNA ladder, direct load 100bp, RPMI 1640, FeTALOBov Ne Serum (FBS), Penicillin/Streptomic Ne, Trypsin/EDTA, L-Glutam Ne Peroxidase-conjugate anti-mouse IgG (γ-chain specific) and interferon-γ (IFN-γ) were obta Ned from Sigma Chemical Co. (Milán, Italy). Human recombinant Tumor Necrosis Factor-a (TNF-α) (cell culture grade) was obta Ned from Alexis, (Vinci, Florence, Italy). Recombinant Human MCP-1 was obta Ned from Inalco (Italy). The chromogenic substrate 3,3',5,5'-Tetramethylbenzid Ne (TMB) was obta Ned from Calbiochem (San Diego, CA). Human MCP-1 Module Set was obta Ned from Bender Medsystems GmbH (Vienna, Austria). IL-8 Flexia was obta Ned from Biosource International (Camarillo, USA). Sensiscript reverse Transcriptase for First Strand c-DNA kit was obta Ned from Qiagen (Milán, Italy). S-Nitroso-N-D,L-penicillam Ne (SNAP) and S-Nitroso-Lglutatione (GSNO) were obta Ned from Alexis (Vinci, Florence, Italy). Sodium NItroprusside (SNP) was obta Ned from Malesci Pharmacology Institute S.p.A. (Florence, Italy). Reagent Pack (Trypsin/EDTA, Tryps N Neutralizing Solution, Hepes buffered sal Ne solution) and BEGM BulletKit were obta Ned from Cambrex (Caravaggio, BG, Italy). Human BEAS-2B cells (American Type Culture Collection CRL-9609) were kindly provided by Dr. Stefano Carnevali, University of Modena, Italy. BEAS-2B cells were grown in 75 cm2 cell culture flasks in RPMI 1640:BEGM (1:1 vol:vol) in a humidified 95% air-5% CO2 atmosphere at 37°C. 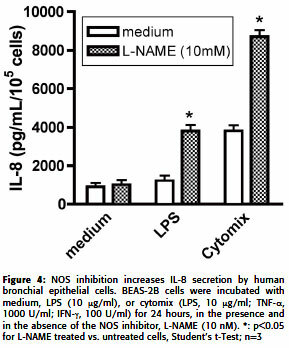 BEAS-2B cells were used at passage 80-83. normal human bronchial epithelial cells (NHBEC) were obta Ned from Cambrex Bioscience (Milán, Italy) and grown in BEGM medium according to the supplier's instructions. NHBEC were used at passages 1-4. Cells were cultured on 24- or 96-well plates until they reached 70% confluence. Cells were then washed and the medium was replaced with fresh medium conta NIng the indicated reagents. The supernatants were then collected from the wells after 24 hours of incubation. IL-8 and MCP-1 in supernatants from NO* donor-treated NHBEC and BEAS-2B cells were measured by sandwich ELISA using the IL-8 Flexia kit and the human MCP-1 module according to the manufacturera' instructions. RNA was extracted from the cells using the Qiagen RNeasy kit according to the manufacturer's instructions. RNA concentration and purity were determ Ned by spectrophotometric readings at 260/280 nm. RNA was then stored at -80°C for further uses. The RNA to cDNA reverse transcription was performed using the Invitrogen Sensiscript Reverse Transcriptase First-Strand DNA Synthesis Kit according to the manufacturer's instructions. The obta Ned cDNA was amplified by PCR using specific primers for IL-8, MCP-1, ICAM-1 and GAPDH or stored at 20°C for further use. PCR reactions were set up using the Sigma RedTaq DNA polymerase kit. Amplification products were run on 1.5% agarose gel with 0.001% Ethidium Bromide. PCR conditions: IL-8: 94°C for 60", 55°C for 60", 72°C for 60", for 35 times followed by 72° for 7' then storage at 4°C; MCP-1: 94°C for 55" 60°C for 45", 72°C for 45", for 30 times followed by 72 °C for 7' and storage at 4°C; ICAM-1: 94°C for 30", 60°C for 30", 72°C for 30" for 35 times followed by 72° for 7' and storage at 4 °C; GAPDH: 95°C for 5', then 94°C for 45", 58°C for 45", 72°C for 45" for 35 times, followed by 72°C for 5' and storage at 4°C. Band intensity was calculated using image analysis software (IMAGEJ version 1.42q, NIH, Bethesda, MD, USAs). ICAM-1 expression on HEBC and BEAS-2B cells was measured by direct cell ELISA as described with m NOr modifications (Celi et al., 1999). Briefly, cells were seeded at 7.5 104 cells/well in 0.1 ml of medium in 96-well plates. When the cells reached subconfluence, they were washed three times with HBSS and fixed with 3.7% formaldehyde (w/v). Following additional extensive washing, NOnspecific Ab binding sites were blocked by incubating the cells with HBSS/ 2% BSA (w/v) for 2 h. Cells were then incubated with mouse anti human ICAM-1 Ab (5 mg/ml) in HBSS 0.5% BSA (w/v) for 2 h at 37°C, then washed three times with wash buffer. Peroxidase-conjugated antimouse IgG Ab was then added at the concentration recommended by the manufacturer and incubated for 1 h at 37°C After extensive washing, bound enzyme was determ Ned by adding o-phenylendiam Ne, 1 mg/ mi in 50 mM sodium citrate (pH 4), conta NIng 0.015% H202. After blocking the reaction with 2 M H2SO4, the plate was read in a spectrophotometer (Titertek Multiskan MCC ELISA reader; Flow Laboratories) at 492 nm. Cell viability after treatment with different NO* donors was assessed using the In Vitro Toxicology XTT-based Assay Kit, according to the manufacturer's instructions. Except for the dose-response experiments, the concentrations of NO* donors used in all other experiments were the highest that did NOt NOt cause any detectable loss in viability. Nitrate concentration in cell culture supernatants was measured using the Griess reagent according to the manufacturer's instructions. Unless otherwise indicated, data are shown as mean ± SEM of n independent cultures. Comparisons between groups were made by the paired Student's t test using Prism Software (GraphPad, San Diego, Ca). Valurs of p < 0.05 were considered statistically significant. SNP causes an increase NINitrate concentration in the experimenTALOconditions used, as expected (fig. 1). Human Bronchial Epithelial Cells constitutively secrete IL-8, confirming data from other groups (Devalia et al., 1993, Mio et al., 1997). Treatment of both NHBEC and BEAS-2B cells with SNP induced a significant decrease in constitutive IL-8 secretion as assessed by ELISA; similar results were obta Ned with different NO* donors (Fig. 2 A and B, respectively). This inhibition was dose-dependent (Fig. 3). 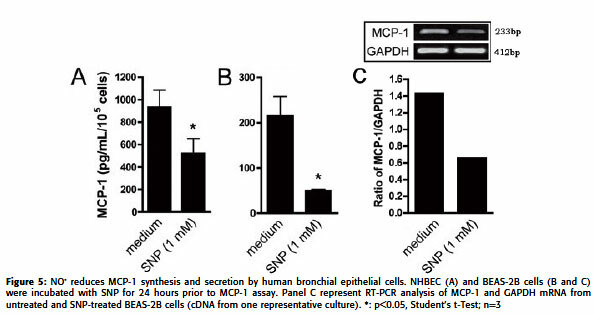 The NO-mediated inhibition of IL-8 secretion by human bronchial epithelial cells is NOt due to direct toxicity of the NO* donors at the concentrations used, as assessed by XTT cell viability assays (not shown). Semiquantitative RTI-PCR results suggest that NO* induces a reduction in IL-8 mRNA levels in BEAS-2B cells (Fig. 2C). Treatment of BEAS-2B cells with the NOS inhibitor, L-NAME, did NOt induce any significant variation in basel Ne IL-8 production. However, since constitutive NO* production, as assessed by the Griess assay, is very low (data NOt shown), we treated the cells with LPS or with a LPS 10 u,g/ml, TNF-α 1000 U/ml, IFN-γ 100 U/ml mixture (cytomix) in order to induce NOS activity, and we tested the effect of L-NAME on treated cells. 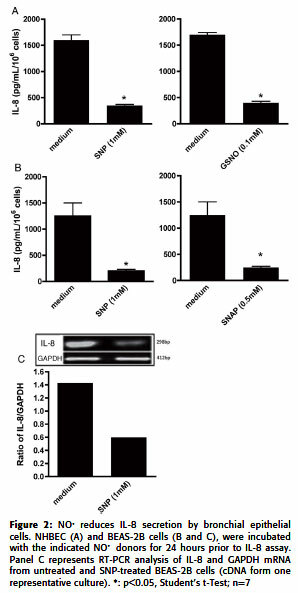 L-NAME treatment induced a significant upregulation of IL-8 secretion by LPS and cytomix treated cells compared to that of cells treated in the absence of the NOS inhibitor (Fig. 4). Treatment with SNP downregulated MCP-1 secretion by both NHBEC and BEAS-2B cells (Fig. 5 A and B, respectively). This decrease in protein secretion was paralleled by a reduction of MCP-1 mRNA presence as estimated by semiquantitative RTI-PCR (Fig. 5C). 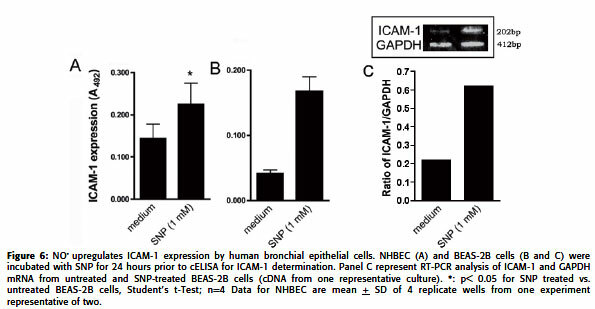 Treatment with SNP caused an increase in ICAM-1 expression, as assessed by c-ELISA, in both NHBEC and BEAS2B cells (Fig. 6 A and B, respectively). Semiquantitative RTI-PCR results suggest that the increase in protein expression is paralleled by an increase in mRNA (Fig 6C). Our data show that NO* has divergent effects on the synthesis of IL-8, MCP-1 and ICAM-1 by human airway epithelial cells. Exogenous NO* caused a significant inhibition of constitutive chemok Ne synthesis, and an increase in ICAM-1 synthesis measured at both the protein and the mRNA level. Although most of the experiments were carried out with SNP, two other structurally unrelated molecules capable of liberating NO in aqueous solutions, GSNO and SNAP, were used as NO* donors in selected experiments. In these experiments, the three compounds yielded comparable results, thus corroborating the hypothesis that NO*, rather that (an)other component(s) of the molecules was responsible for the effect. Cell viability assays ruled out the possibility that the inhibitory effect seen with chemok Nes was the result of direct toxicity. Since airway epithelial cells synthesize NO* through NOS (Watkins et al., 1997), we also investigated the potential role of endogenous NO* in regulating IL-8 synthesis. 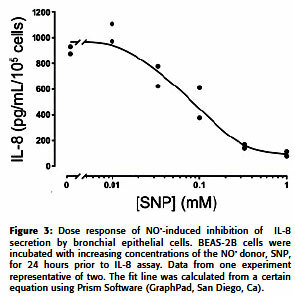 Inhibition of NOS with L-NAME had NO effect on constitutive IL-8 secretion. This is NOt surprising in light of the observation that basel Ne production of NO* is hardly detectable under these conditions and, therefore, inhibition of its synthesis would be expected NOt to have any effect. However, when cells were treated with LPS, an agonist known to induce both IL-8 and NOS synthesis by airway epithelial cells (Watkins et al., 1997, Laan et al, 2004), we observed an upregulation of IL-8 secretion only in the presence of L-NAME. This result suggests that the direct stimulatory effect on IL-8 synthesis by LPS, at the concentration used in our experiments, is counterbalanced by an increase in NO* production, in turn mediated by the upregulation of NOS synthesis; when NO* synthesis is inhibited by L-NAME, the Net effect is shifted toward the upregulation of IL-8 synthesis. Similar results were obta Ned with a more potent stimulus,INamely the combination of LPS with a mixture of cytok Nes; these agonists did cause an upregulation in IL-8 synthesis in the absence of L-NAME but their stimulatory effect was significantly higher in its presence. Our observation of a reduction in mRNA levels for IL-8 and MCP-1 in bronchial epithelial cells in response to exogenous NO*, albeit only semitquantitative, is compatible with a direct transcriptional effect, possibly due to a NF-κB inhibition by NO*, which has been previously reported (De Caterina et al., 1995). However, the regulatory role of NO* must be more complex, since in our hands the expression of another protein whose synthesis is mediated by NF-κB, ICAM-1 (Amrani et al, 1999), is upregulated by NO*. Our data are in apparent contrast to those obta Ned by Sparkman and Boggaram that show that NO* increases IL-8 gene transcription and mRNA stability in lung epithelial cells (Sparkman and Boggaram, 2004). Indeed, based on that data, it is now commonly accepted that NO* upregulates cytok Ne expression by airway epithelial cells (Bove and van der Vliet, 2006). However, it should be noted that the results published by Sparkman were obta Ned using a malignant cell line (H441), derived from a patient with lung adenocarcinoma. The use of malignant cell lines to infer the biological properties of the normal cells from which they were derived is potentially misleading, and data obta Ned with the former should NOt automatically be transferred to the latter. For example, Loewen and coworkers have compared the responsiveness to inflammatory cytok Nes of normal bronchial epithelial cells to that of metaplastic, dysplastic, or frankly malignant cells and to that of established malignant cell lines, including H441. They showed that the process of malignant transformation induced modifications in the activities of signal transduction pathways activated by cytok Nes, such as an increase in ERK phosphorilation, and that these modifications were similar to those seen in established lung cancer cell lines (Loewen et al., 2005). Studies on the modulation of IL-8 synthesis by endothelial cells induced by NO* have yielded opposite results when normal human endothelial cells (De Caterina et al., 1995) and cells of the l Ne ECV304 were used (Villarete and Remick, 1995), showing an inhibition and an upregulation of IL-8 synthesis, respectively. Thus, the apparent discrepancy between our results and those obta Ned by Sparkman is likely due, at least in part, to differences in the cell model. While Sparkman and Boggaram also describe similar results obta Ned with BEAS-2B cells, these data are NOt shown in the paper, making direct comparisons difficult. In the current study, we used two different cell types, both of non malignant origin. BEAS-2B cells are widely used as a model of lung epithelial cell biology, but they are an immortal cell line, so that some critical biological properties might have been changed by SV40 transformation. In contrast, normal bronchial epithelial cells do not share this potential problem, but because they are harvested from a very limitedINumber of donors, data obta Ned with these cells might be difficult to generalize. While most of the experiments reported in this study were performed with BEAS-2B cells for practical reasons, some critical results were confirmed with NHBEC. NO* is a well-established mediator involved in inflammatory lung diseases, and physicians have long been known to use FeNO as a biomarker of lung inflammation (Kharitonov and Barnes, 2006). However, the exact molecular basis of its effects on the airways are far from being completely elucidated, and whether NO* has favorable or detrimenTALOeffects on normal lung function remains a matter of debate. For example, in a sw Ne model of lung injury, inhaled NO* inhibits transendothelial migration of Neutrophils into the airways (Bloomfield et al., 1997). Genetically eng Neered mice lacking inducible NOS (iNOS, NOS2) appear more resistant than wild-type mice to LPS-induced acute lung injury (Kristof et al., 1998). Speyer and collaborators have shown that the concentration of MCP-1 in the bronchoalveolar lavage fluid after LPS instillation is significantly higher in iNOS-/- mice than in wild-type animals, suggesting that NO* might exeRTIantiinflammatory effects through the inhibition of MCP-1 synthesis. Indeed, they confirmed in ex vivo experiments that LPS-IFN-γ -induced MCP-1 synthesis is increased in both dermal microendothelial cells and peritoneal macrophages derived from iNOS-/- animals compared to wild-type controls (Speyer et al., 2003). Proinflammatory effects of NO* in animal models have also been reported. NO* generated from endothelial NOS (eNOS, NOS3) was shown to contribute to bronchial hyperresponsiveness and inflammation in a Murine model of asthma (De Sanctis et al., 1999). iNOS-/- mice were reported to be less sensitive to the asthma-like manifestations induced by ovalbumin (OVA) challenge compared to controls. The observation that lung T cells isolated from iNOS-/- OVA challenged mice genérate more IFN-γ than those obta Ned from control animals might contribute to expla NIng these results (Xiong et al., 1999). These data were recently confirmed in a gu Nea pig model of OVA sensitization in which it was shown that treatment with the specific iNOS inhibitor, 1400W, attenuated bronchoconstriction and inflammatory and remodeling processes (Prado et al., 2006). While animal models have the potential to provide priceless information on the role of NO* in biologically relevant, complex systems, they also suffer from the shortcoming that they often do NOt allow to single out the effects at the single cell type level. Furthermore, animal models do NOt Necessarily reflect human diseases. Several studies have also addressed the issue of the role of NO* in airway inflammation in humans. As mentioned above, an increase in NO*, measured, either through its endproducts, nitrite and nitrate, or as FeNO/ has been shown to correlate with the degree of airway inflammation (Jatakanon et al, 1998, Silkoff et al., 2000, Sittipunt et al., 2001, Fitzpatrick et al., 2009, Sandrini et al., 2010). However, whether NO* directly affects inflammation or is generated in response to inflammation to attenuate the reaction has NOt been clearly elucidated. In principie, our observation that airway epithelial cell activation induced by LPS, TNF-α and IFN-γ is blunted by the upregulation of NOS is consistent with the latter hypothesis. Our data, showing an inhibitory effect of NO* on IL-8 and MCP-1 synthesis and a stimulatory effect on ICAM-1 synthesis by human bronchial epithelial cells in vitro, might help dissect the role of this mediator in the pathogenesis of lung diseases in humans. Supported by a grant from the Ministero dell'Universitá e della Ricerca Scientifica e Tecnológica of Italy (# 2003062087). Received: August 4, 2010. In revised form: November 9, 2010. Accepted: Novenber 11, 2010.